The Staco Unistar VP series is a single phase Uninterpretable Power System that is designed for stand alone or parallel operation in a size of 6kVA and 10kVA modules. 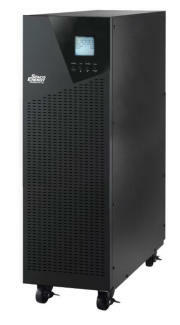 This UPS series can be either a rack mount or tower designed system. This series is ideal for data centers that need to provide for future growth of the UPS power system to match the needs for future expansion of the data center. With the ability to expand up to (3) modules in parallel, this allows for a scalable, and flexible power architecture in the single phase line. The system can be designed with an optional external maintenance bypass panel, that will ensures a continuous supply of power to the critical load. Your critical load can be supplied power from utility source through the external maintenance bypass panel while your UPS system is off line during service or periodic maintenance of the UPS system. 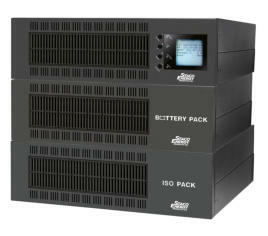 Benefits: • Parallel up to three units for added capacity or redundancy, using a simple connection on the rear panel without an additional cabinet • Double conversion design • Optional galvanic isolation transformer • Optional matching battery packs • Hot-Swappable Battery Packs • 3 year Warranty on electronics.